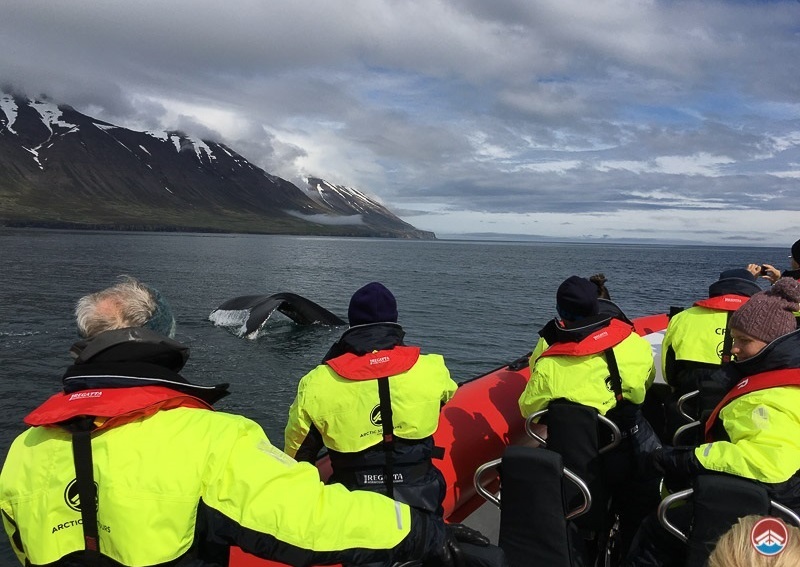 Dalvik is an extremely popular area for whale watching, due to its excellent success rates which are an average of about 99%! In fact, the Eyjafjordur whale watching area is one of the best in the world and it doesn't hurt that it's located in extremely picturesque settings. The fjord is surrounded with the majestic and vast mountains of Tröllaskagi and scenic landscapes all around. Locals have years of experience and extensive knowledge of the magnificent ocean life in the area making the whale watching tours even more interesting. Whales tend to love the North-Icelandic waters. There is a volcanic fissure in the ocean ground that allows some heat to filter up from the deep. Zooplankton and the krill flourish in this mixing of warm and cold currents in the sheltered Eyjafjörður bay. This creates especially rich feeding grounds that attract all kinds of the whales. Thanks to these favorable conditions, Dalvík is an extremely popular area for whale watching. The chance of seeing whales exceeds an incredible 98 percent, with over 99 percent sighting rates in summer! This makes the Dalvík whale watching area one of the best in the world. There is a good chance you’ll encounter humpback whales, white-beaked dolphins, minke whales and harbor porpoises. 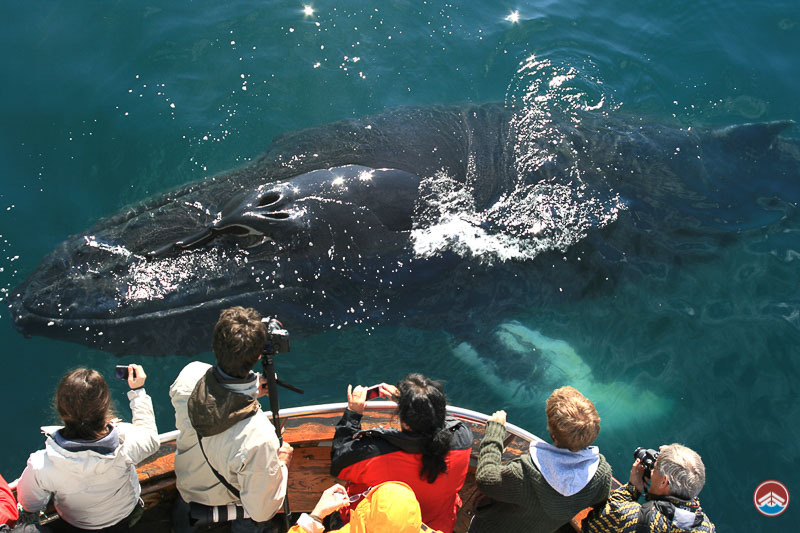 These are some of most commonly spotted creatures on a whale watching tour from Dalvík. Sometimes even the majestic blue whale visits the bay! On our classic arctic whale watching tour, you can try some sea angling as well. Expect a lot of fun, and your catch success is guaranteed! After the tour, we will put your fresh fish on the barbecue and enjoy freshly-caught cod, haddock, pollock or Atlantic catfish. Humpback whales are 13 to 17 meters long and are the liveliest of all whales. Apparently, they are not shy at all and they don’t mind being observed. Humpbacks often love to show themselves and put on a display. They approach the boat, roll over, leap out of the sea, and slap and splash with their fins and flukes on the surface. The great Humpback whales always raise their flukes out of the water when diving. It is pretty likely that you will see at least one Humpback on our whale watching tour. Minke whales are somewhat smaller than Humpbacks. They are also known for their curiosity. They sometimes approach the vessels and dive under them and then stick their heads up out of the sea. This behavior is called spy-hopping and no one really knows why they do it. The harbor porpoise is one of the smallest of the cetaceans. They are quite shy, but sightings are still very common on our whale watching tours. White-beaked dolphins are often called toothed whales. They are more playful and sociable than harbor porpoises. They usually show up in larger groups and are often quite curious about us. The bay where Dalvik village is located is known for its extremely picturesque settings. The majestic mountains of Tröllskagi, often called the “Troll Peninsula,” crown the fjord. You will see breathtaking landscapes all around the bay. Dalvík is an old fishing village, close to Akureyri in North Iceland. It has a population of approximately 1,400 inhabitants. The village is located in Tröllaskagi and high mountains and stunning scenery surrounding the charming town, which lies on the western shore of Eyjafjordur fjord. Besides the whales, magnificent fjord scenery awaits you on this tour! As the ferry to Grímsey island - that is crossed by the Arctic Circle - departs from here, Dalvík is literally the gateway to the Arctic Circle. 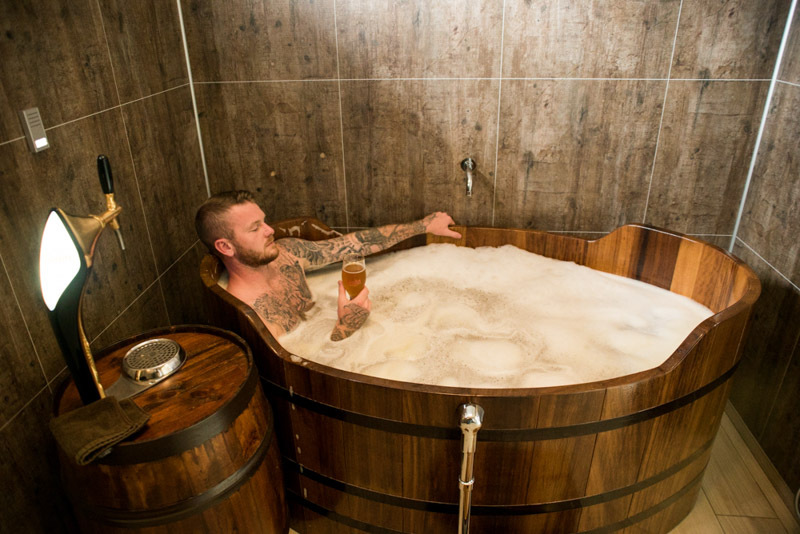 Although marine life is generally the main attraction in Dalvik (at least in our opinion), there are various other popular activities in the area. The Troll Peninsula is the biggest continuous mountain area in Iceland, providing a setting for lots of outdoor activities. Skiing and heliskiing have become popular activities in winter with skiers coming from all over the world to test the untouched slopes of Trollaskagi. You can also find multiple hiking trails all around the Troll Peninsula and great trails for mountain biking. 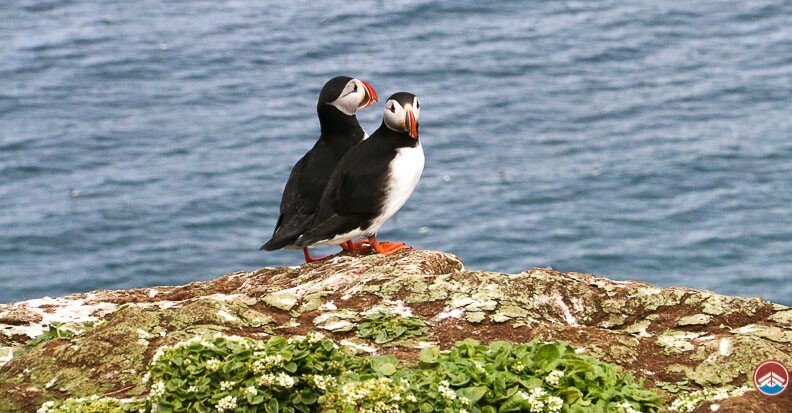 In the summertime, there are scheduled puffin-watching tours, making it a great trip for bird lovers or pretty much anyone who loves the outdoors. And of course, don't forget the swimming pool! Every year on the second weekend in August, the whole town of Dalvik gathers for a festival dedicated to fish. People drive in from all around the country to join in the festivities and try delicious tasting provided by the locals. This day is called Fiskidagurinn Mikli or the "Great Fish Day".